Mike Ashley's Sports Direct has struck a £90m deal to rescue parts of House of Fraser shortly after the department store fell into administration, raising hopes for the future of thousands of staff. 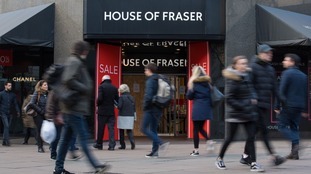 House of Fraser earlier announced it had fallen into administration, putting the entire workforce at risk, however it now appears at least some of the business will be saved. Some 17,000 staff are now being informed that they will be transferred over from House of Fraser to Sports Direct. Sports Direct will work with administrators EY through a pre-pack process, where the new buyer will cherry pick the best assets. Prior to its collapse, Sports Direct owner Mike Ashley had held an 11% stake in the department store chain. It is understood that Mr Day's proposal was in excess of £100 million, would have avoided an administration and included House of Fraser's pension scheme. However, accountancy giant EY, which was overseeing the process, opted for Mr Ashley's offer. Philip Hammond said that high street stores needed to adapt. Asked whether reducing business rates could help the ailing the high street, Chancellor Philip Hammond told ITV News the problem was "structural". He said that high street shops had to adapt in the light that most shopping was now being done online, rather than in store. "If we reduce business rates we've got to make up revenues somewhere else," he said. "What we're looking at is how we can re-balance our tax system so it is fair to businesses both doing business on the high street and businesses doing business online." House of Fraser was plunged into fresh crisis after C.banner, the Chinese owner of Hamleys, pulled its investment into the troubled retail chain. Mr Ashley's acquisition comes a day after the closure of the football transfer window, in which the Newcastle United owner was accused by fans of failing to invest sufficiently in players. In response to the news of the buyout of House of Fraser, former Newcastle captain Alan Shearer - a vocal critic of Mr Ashley - joked on Twitter: "What position does he play?"